There are very few people I am aware of who know the extensive Taylor Guitar line like our own Mike Gray. He knows the regular line like the back of his hand, and we’re talking over 120 models! He is familiar with all of the Fall & Spring Limited Editions, is constantly putting together special Build-to-Order custom guitars for our store and often brainstorming with Grant & I regarding the next custom R. Taylor masterpiece. When Mike goes home at night what is the first thing he does? Plays his own personal Taylor of course! So why were we not surprised when our sales rep Steve Parr called and offered to fly him out to California for this year’s Taylor Guitars Tour! I thought I would post a few of the many photos Mike took while in the comprehensive Taylor Guitar facilities. As you might imagine, the folks at Taylor were friendly, extremely knowlegeable and very well organized. This is one factory that is the envy of our industry … balancing on that very thin line between a healthy respect for tried & true methods and ground breaking innovation! Thanks to Bob Taylor, Steve Parr (one of the very best in the biz! ), John DiMaggio and all of the people at Taylor for this great opportunity! 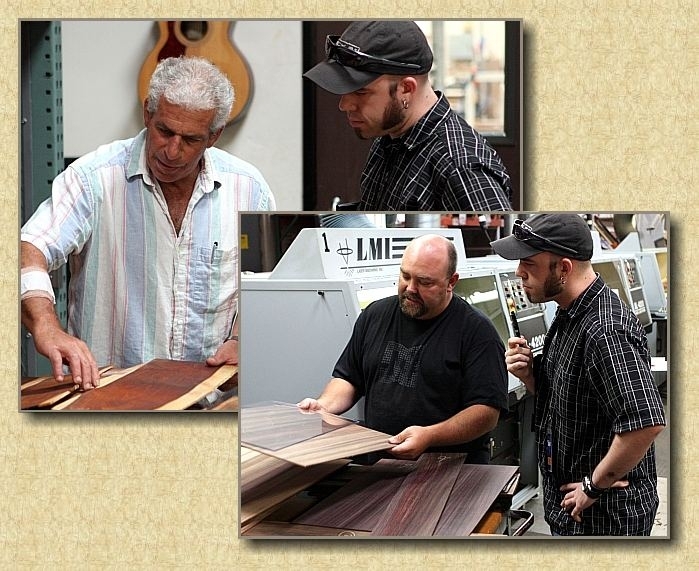 Top: Mike picking out a stunning set of Cocobolo with John DiMaggio for our next R. Taylor custom instrument. Inset: Joe Bina of Taylor Guitars shows Mike some of the criteria that is involved in selecting tonewoods. It all starts with the wood folks. Taylor has stockpiled one of the largest and most varied assortment of tonewoods in the world. Wood for Taylor guitars not only has to be dried (moisture content) but well seasoned (sap crystallization) to fulfill their rigorous standards. This kind of “Ferris Wheel” style clamping device has been used in factories since the ’60s. Taylor makes efficient use of it, in this case for clamping Limited Edition backs. 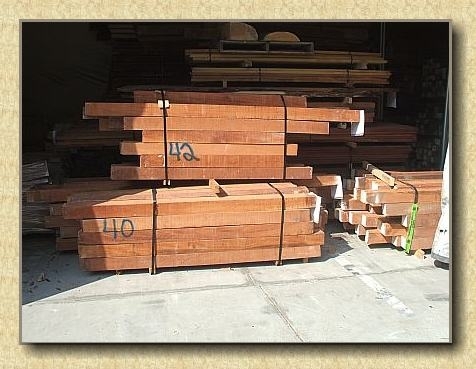 Notice the Cocobolo with Hawaiian koa center wedges! Mike was definitely impressed with the speed & precision of the Laser technology in use at the Taylor facility. 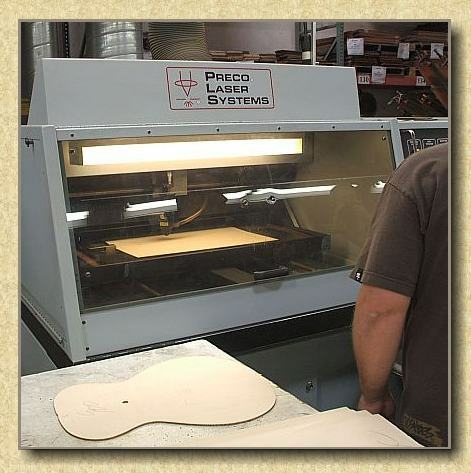 In this instance, spruce tops are being cut … rapidly but with precision and without the danger of tear-out or damage from crude bandsaw blades or overhead routers. 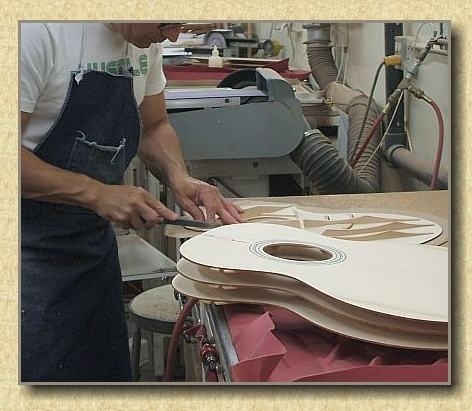 Finish work … always one of the areas that separates the men from the boys in guitar building. 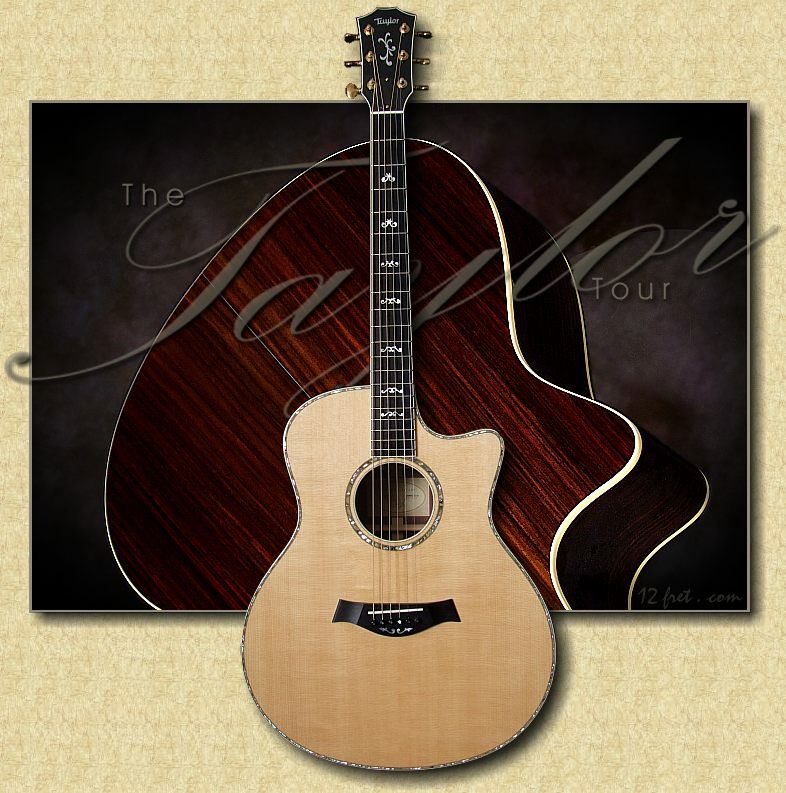 Long known for their pristine flawless finishes, Taylor has pioneered new finish techniques and been a leader in finish technology in North America for years. 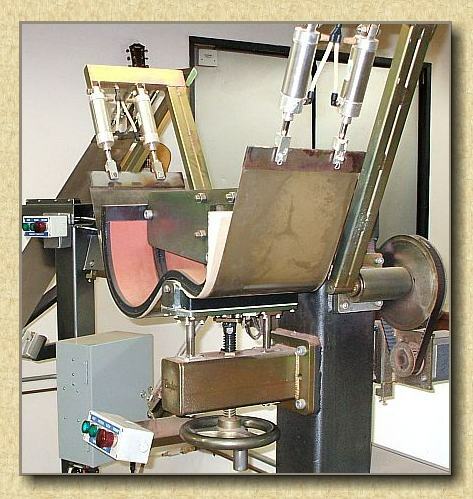 This photo shows a robotic buffing booth. Yes, you heard me … robotic! This technology allows the highest quality of gloss finish but does it quicker and with fewer buff-throughs. This is a very intelligent use of technology that ensures very high quality results, improves efficiency, and keeps pricing competitive. 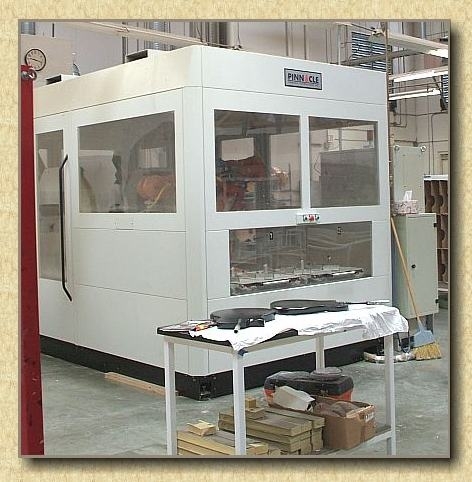 Computer controlled milling machines are prevalent throughout our industry for a reason. They can duplicate extremely complex contours to precision tolerances … something that is pretty handy in a guitar building environment. 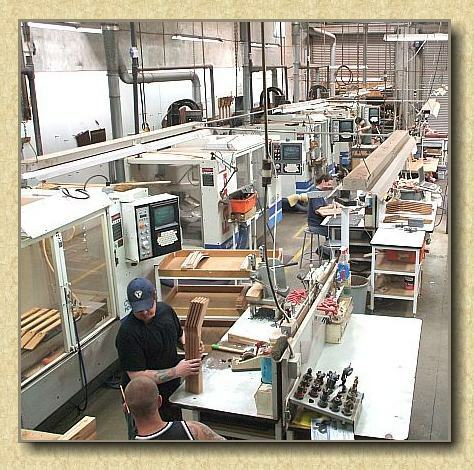 This photo shows a line of CNC machines performing operations including neck carving. Well isn’t this just the coolest looking machine! Yes, you guessed it … this one automatically bends the sides. 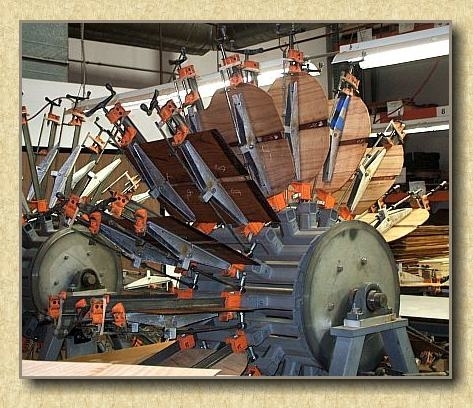 The natural oils in some woods, notably Indian rosewood, allows relatively easy bending when the wood is lightly moistened and heated on a machine like this. Other woods with no natural oils and high figure can be a completely different story! Yes, sometimes simpler is better. 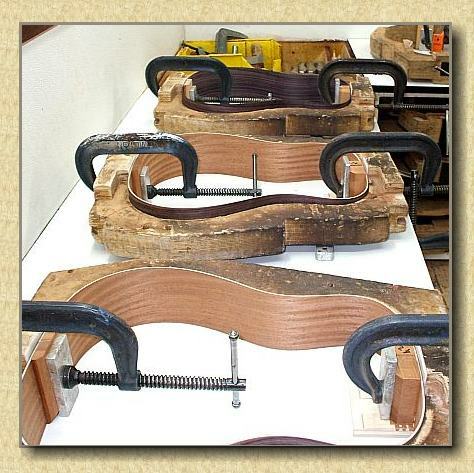 This is the way “frames” have been glued up for a hundred years. As opposed to the inside molds that violin builders employ, guitar luthiers usually use an outside mold such as these to ensure symmetry & consistency. Nothing beats a good old C-clamp for applying foot/pounds pressure! Here’s one of the craftsmen in the top strutting area using a chisel to taper the main X-brace in preparation for completing the box of a Grand Auditorium. Yes, there are still lots of operations heavily dependent on the skills of experienced craftspeople. 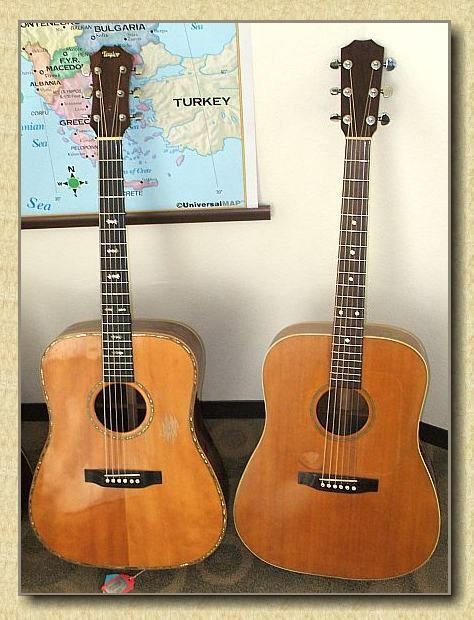 Near the end of the tour, Bob Taylor himself graciously showed Mike a couple of his earliest instruments. Looks like this guy was talented right from the start … and according to Mike they sounded quite spectacular too!